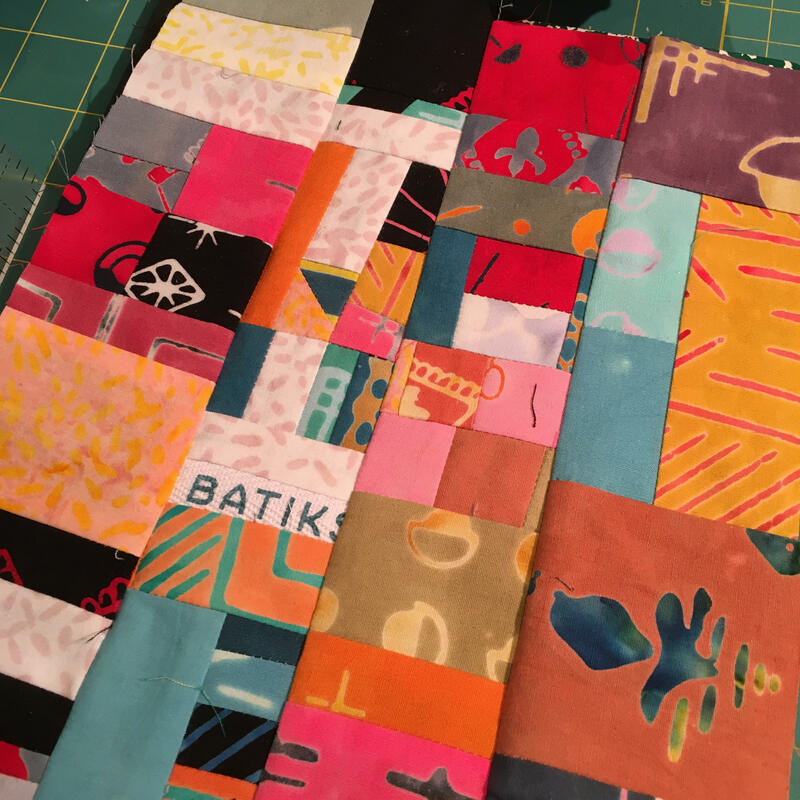 We keep trucking along here – Welcome to The Tie One On Blog Hop Day 4 with the incredible quilting whirlwind, Cheryl Arkison! Her Lilla quilt in Tie One On is flooring me and calling me to make it. Right. Now. Here is her post on her process which is a great read because she talks honestly and clearly about things that delighted and frustrated her along the way as she created this beauty. AND best of all, how she rose above her frustrations to embrace options and come up with a quilt top that she really likes. She sent me some of her pictures so I could whet your appetite here and then send you to her post for the rest of them. This one below is my favorite! 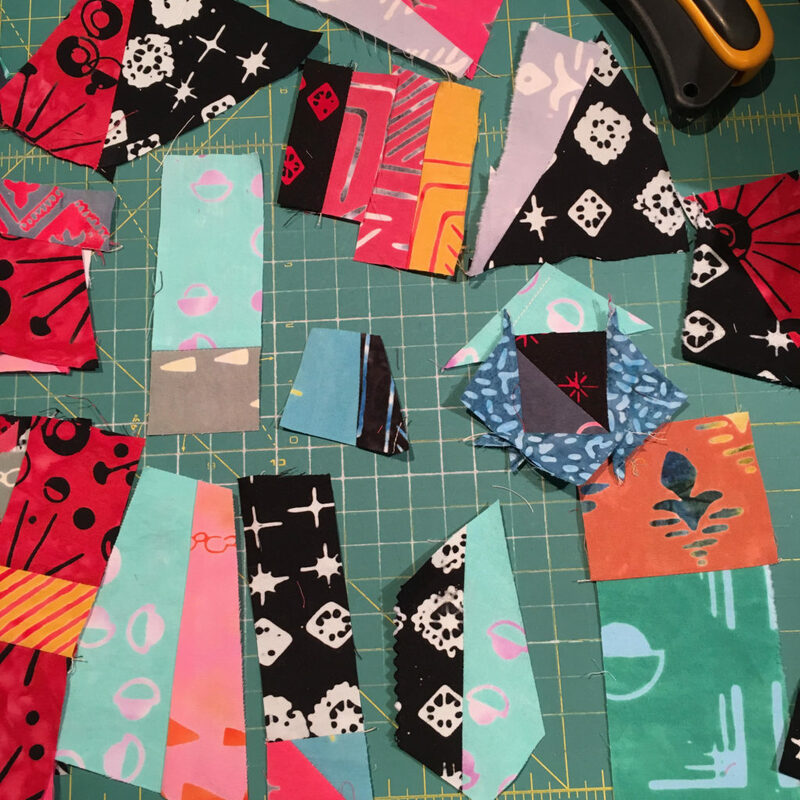 Be sure to check out Cheryl’s post and comment there to win yourself a Fat Quarter pack! Now for my improv takes using Tie One On . . . I thought for today in honor of Cheryl’s Prolific Improv work, for my pix, I would show you some of my Tie One On “morning makes” (something Cheryl does pretty much every day on her Instagram feed). And then here below is almost the entire cover for a journal made from similar little improv combos. I love journals and typically have 3-6 going at one time. 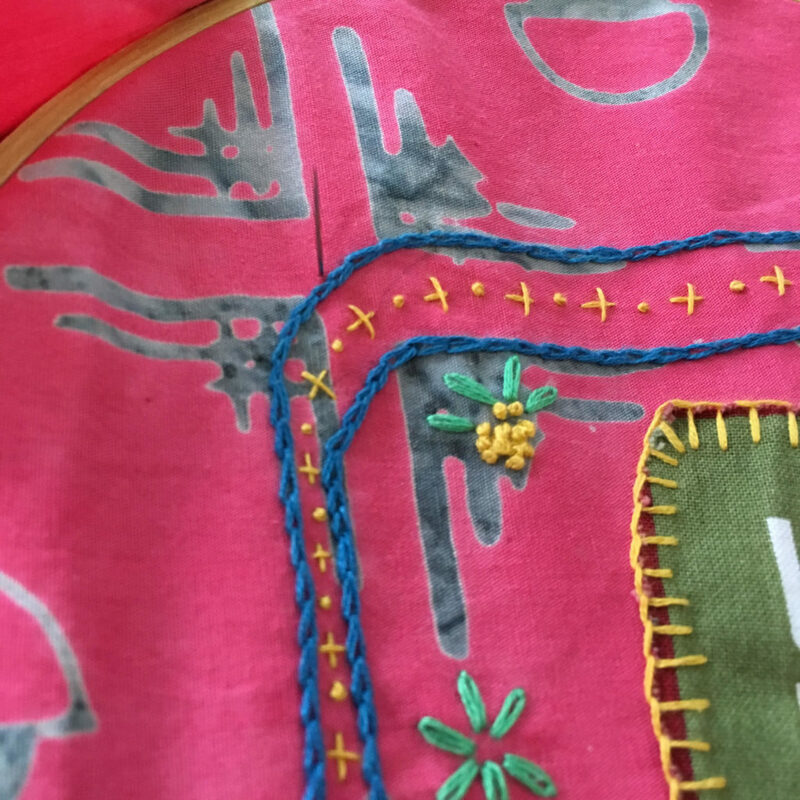 This little snip of photo is a detail shot showing more progress on that embroidery photo from yesterday’s post. And that’s it for today’s post. Pretty late in the day, even on the Western Coast of the USA . 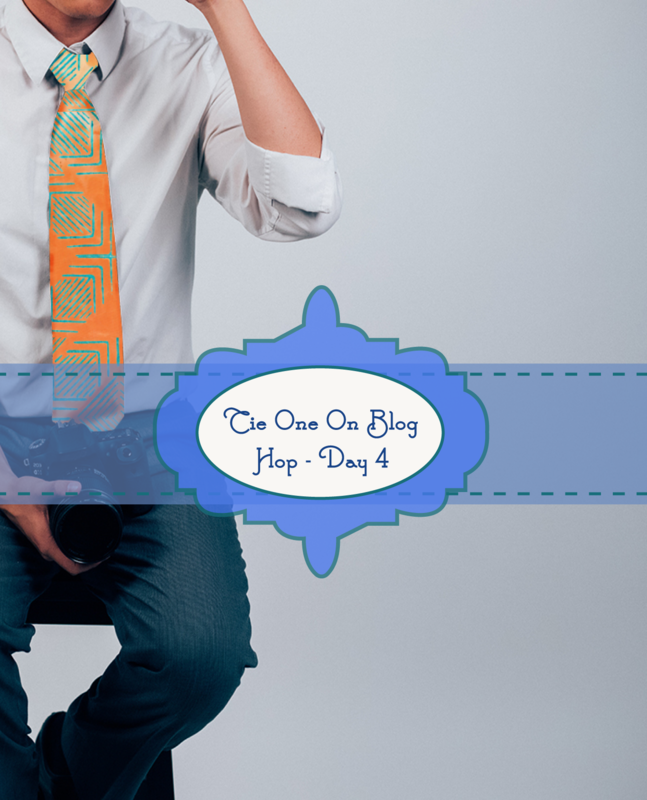 The next couple of days in the Blog Hop should be earlier in the morning. 9/25 – Cheryl Arkison — That’s TODAY! I am with you I love journals too. I love the fabric. 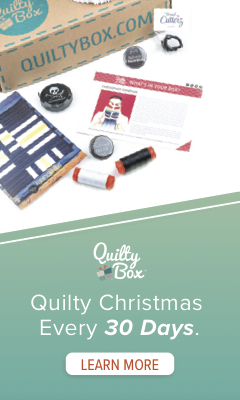 I love seeing all the different projects being created with your new line! Really fun creations, so bright and interesting! Love the embroidery embellishing. I don’t keep up with journals so I start strong and fizzle out. Love the look of them and the idea…. just can’t keep them going. Cheryl’s quilt is very interesting. I love using different techniques on quilting. Love that red and black fabric! Hadn’t noticed it before! 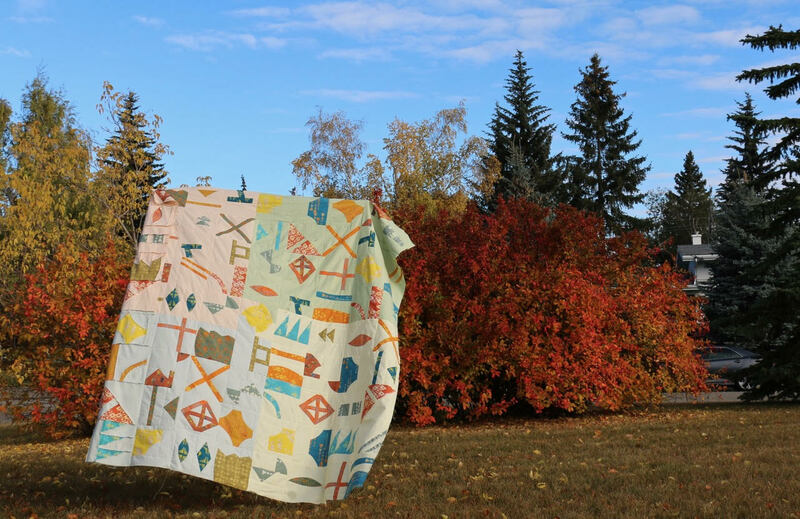 Cheryl’s quilt is very pretty and your fabrics look great in it. I have never written a journal, but this is something that would be great to leave for your kids. Something that would not only be for them to remember you by, but to know you better. I wish I had thought of it years ago. Like your improv work. Someday I will have to try that. I love your embroidery stitches on your close up, very nice! Improv works are interesting, I’ve made one called the Broken Soldier in Patriotic colors. Very interpretive when you look at them! What fun to look back on those journals. Love these batiks. Oh yes! Another Morning Make convert. Thanks for letting me play with your beautiful fabric. I really like the embroidery embellishments on your cover. 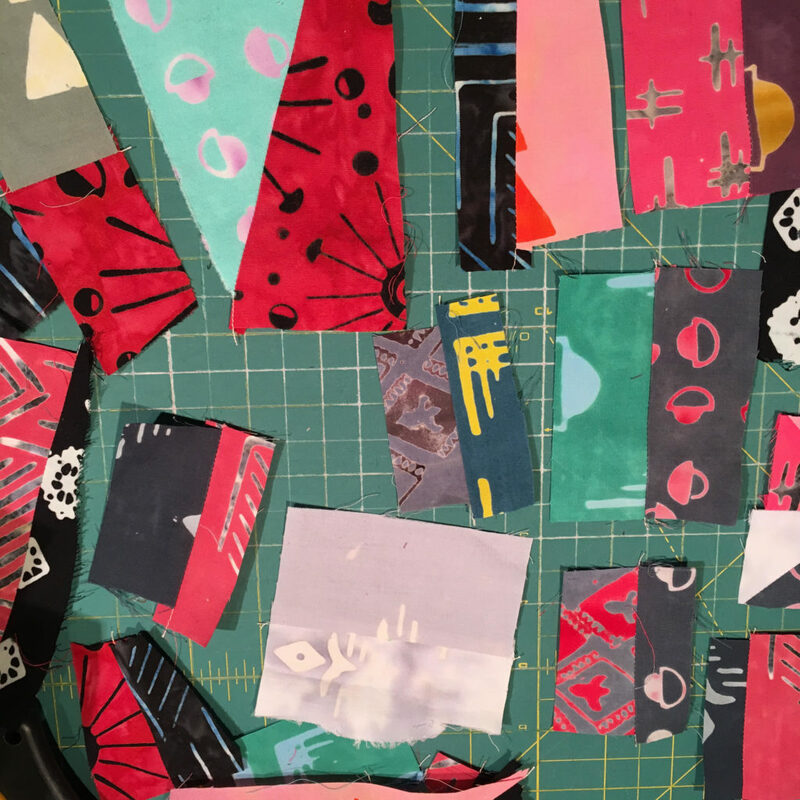 Love the look of your wonderful fabrics all chopped up and sewn improv style! I haven’t tried improv sewing. A think a journal cover would be a great way to start.